This technically sophisticated display with a big LCD screen, a diffused cloud video, LED lighting inside the feature wall and more special details here and there was a challenge to our liking. This mixed together with a short preparation period and a one and a half day set up time kept us rather busy. The award came not only from a satisfied client but also from the many people, who stopped to take the visual impression of this powerful display in. 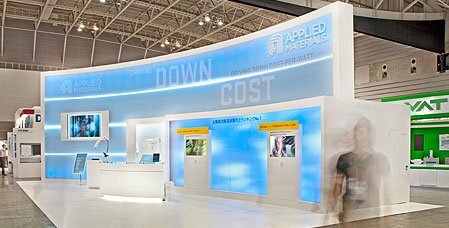 Applied Materials, Inc. is a leading capital equipment producer serving the semiconductor, TFT LCD display, Glass, WEB and solar (crystalline and thin film) manufacturing industries. Applied Materials was founded in 1967 and went public in 1972.